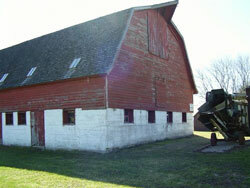 The barn is on the original site it was erected on. The upper level of our big red barn has been converted into an exhibit area displaying farming artifacts and tools from early pioneer life. It also serves as an auditorium for entertainers at various times in the summer.